Lord Ganesha operating the computer! It’s a collector’s world. Everything right from the tiniest pin to the biggest art piece, they all find a place under the sun. Among such collectors, stands out Dr Rajesh Kochhar, Professor of Pharmaceutical Heritage, NIPER (National Institute of Pharmaceutical Education and Research), Mohali. He has a unique collection of about 200 dhokra brass craft items from East India that include animal figurines like elephants, bulls, birds to old diya stands, gods and goddesses. What catches our fancy is Lord Ganesha in various forms. 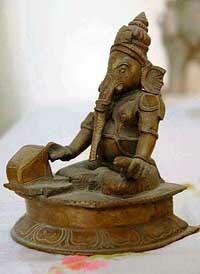 Though in total, there are only 32 permitted forms of Ganesha, but our man has Lord Ganesha reading a book, sitting in front of a computer and even talking on the phone. Out of the total 200 items, 75 are of Ganeshas. So how did it all start, we ask him. “It all began in 1999 when we were working on a rural development programme to focus on rural technology and to help the dhokra shilpis in West Bengal, Orissa and Jharkand. So my professional interests expanded to personal interests and I started looking for these items in emporiums, shops, villages or wherever I travelled,” says the former director of NISTADS, New Delhi. For those uninitiated, dhokra is a century-old craft of metal casting by the lost-wax technique. “Interestingly, India represents an unbroken tradition that goes back to 3000 BC,” adds Dr Kochar, who initially studied the art and crafts as part of his official duties and then started building a collection. 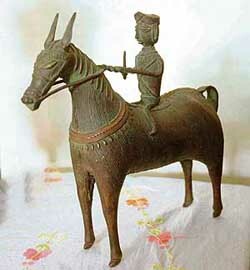 Some of the rare antique items have also found places in his collection, including two unique diya stands with a bird and elephant strung with it from Orissa, an idol of Varalaxmi from Bardwan district in West Bengal, a Bankura horse from Bankura in West Bengal and even a panchdhatu Ganesh from Swamimalai down South. A look at his collection is quite an eye-opener as each item comes with relevant information regarding a particular piece is documented and catalogued and even maintains a stock register which include minutest details like the date and day of procurement, the name of the artist and the place of origin. “I will not mind parting with my collection for research’s sake and that’s why I take utmost care even to clean them myself,” he insists. This entry was posted on Saturday, December 20th, 2008 at 13:34 and is filed under Blogs (Articles). You can follow any responses to this entry through the RSS 2.0 feed. You can leave a response, or trackback from your own site.